A Root Canal is a dental procedure to fix a tooth by removing the pulp chamber of the tooth and filling it with a suitable filling material. A root canal is usually performed when the tooth cannot be filled or restored any other way because the decay has reached the nerve of the tooth or the tooth has become infected. Needing a Root Canal is a serious matter, it can often mean you have infection that could enter your bloodstream and cause serious issues if not taken care of immediately. Other concerns are the rapid spread of decay throughout your mouth, broken and chipped teeth, continuous pain or discomfort and more. Take a look at some of the signs that you may need a root canal. 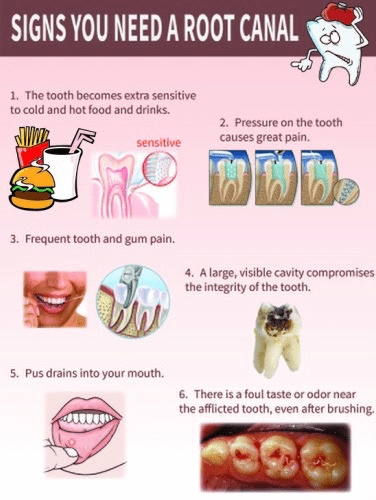 If you experience any of these, we ask that you make an appointment so we can get you taken care of right away! Your Health Matters!